IMPULSE –the change in the momentum of a body as a result of a force acting upon it. Balanced nutrition for today’s modern show goats. Cutting edge nutrition with the latest research technology from Longview Animal Nutrition Center research. 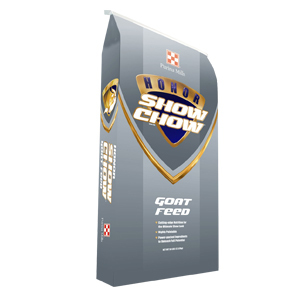 Honor Show Chow IMPULSE Textured Goat R-20 can be used for growing and finishing meat goats being fed for show. Honor® Show Chow® Impulse® Textured Goat R-20 is a complete and balanced ration in textured form. It provides the nutritional extras kids need in both the growing and finishing phases. There is no need to add roughage or grain to the ration. Honor® Show Chow® Impulse® Textured Goat R-20 meets the specific nutritional needs of growing and finishing goats. Typical Feeding Rates for Impulse™ Show Goat: Goat’s Body Weight, Lbs Feeding Range 30 - 50.....................................................................1 - 2 50 - 70..................................................................2 - 2.8 70 - 90..................................................................2.8 - 4 90 - Market..............................................................4 - 5 Feed continuously and have Honor® Show Chow® Impulse® Textured Goat R-20 before nursing kids at all times. To maintain adult animals, feed 1-2 lbs per 100 lbs of body weight along with adequate roughage or pasture. These are only guidelines for consumption. Feed consumption will vary with life stage, environment and activity. *Ask your dealer if Rumensin option is available in your market. Important: 1. Start kids on colostrum milk from birth to 3 days of age. Feed Purina® Kid Milk Replacer from 2 days until 4-8 weeks of age. 2. Use Honor® Show Chow® Impulse® Textured Goat R-20 as a creep feed for rapidly growing young goats prior to weaning. 3. If kids have not been creep-fed or they were purchased, they should be placed on grass hay on a free-choice basis after arrival. On the second day, feed Honor® Show Chow® Impulse® Textured Goat R-20 at the rate of 2.5 to 4% of their body weight per day. Always offer plenty of clean,fresh water at all times. We suggest offering a small amount of additional roughage per day (minimum of 1/4 flake or 1/4 lbs of good quality hay). Gradually increase the amount of Honor® Show Chow® Impulse® Textured Goat R-20 and decrease the amount of hay over a 3-week period of time so that by the end of 3 weeks, they are consuming 3-4% of their body weight as Honor® Show Chow® Impulse® Textured Goat R-20. After 3 weeks, Honor® Show Chow® Impulse® Textured Goat R-20 should be the sole diet and no additional forage is required. 4. When making a ration change, allow 3 to 5 days for animals to adjust to the new ration. 5. Keep a constant supply of complete feed available. Do not let fine material accumulate in feeders. 6. Provide adequate, well-protected and well-managed bunk space for each animal to prevent feed from becoming wet or moldy. 7. Provide a source of fresh, clean water at all times. 8. Feed salt free-choice. 9. Feed Purina® Goat Mineral free-choice. 10. Consult your veterinarian for the recommended health program for your local area. This includes internal and external parasite control. 11. This product contains copper and should not be fed to sheep. In groups of goats, there are certain animals that experience chronic bloat or other digestive disturbances, and consequently are poor performers. In addition, excess feed consumption, severe weather changes resulting in erratic feed consumption and poorly-managed feeding practices can increase the incidence of bloat in all goats. If bloating occurs, the above management practices should be reviewed and your veterinarian consulted. Caution: Store in a dry, well-ventilated area free from all rodents and insects. Do not use moldy or insect-infested feed.